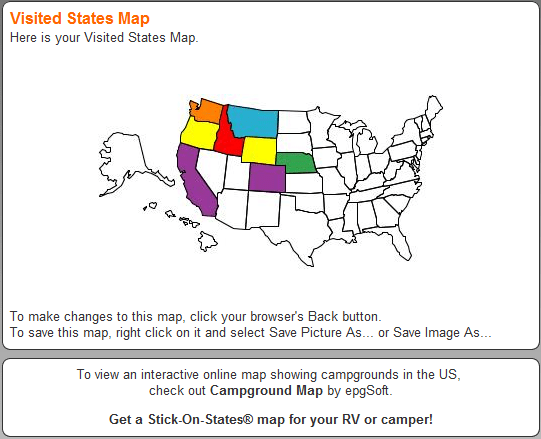 Would you like to have your very own map of visited states? Many travelers include this as part of their email signature, or in their blog posts or on Facebook. It’s easy and free by going to http://epgsoft.com/. 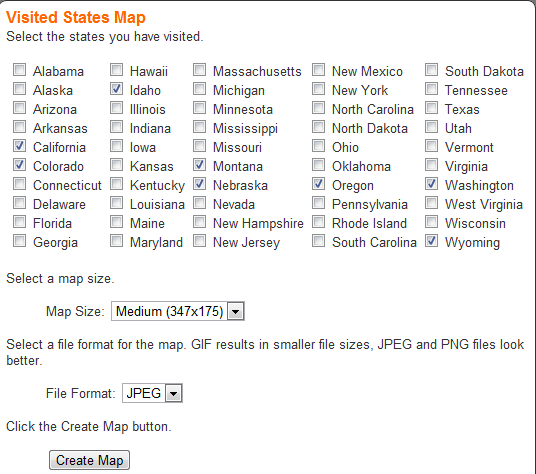 Just choose ‘Create Map’ and ‘Visited States Map.’ You should now see a listing of all the states. Check off the ones you have visited, then Create Map. If you find that you’ve missed some states, or selected some by mistake, you can click the Back button on your browser to fix it, then click on Create Map once again to see the corrected version. Once the map looks how you want it, you right-click on it and choose Save Picture As (or Save Image As – depending on your browser.) Navigate to the folder where you want to store it and click ok. Now the map is a picture on your computer that you can use like any other picture. Published by MrsGeek, in Blog. Tagged with visited countries map, visited states map.